One of Bulc Club’s many advantages is that you can automatically see who sold your Bulc Club forwarder. And while this may satisfy your curiosity for why you could’ve been receiving additional bulkmail, it also goes a long way toward preventing it, along with anxiety, stress, and even identity theft. Intrigued? Imagine you visit FreeCreditReports.com and sign-up to receive a free credit report online using the forwarder: credit-report@smith.bulc.club, you may find yourself receiving bulkmail from other online service providers. Click on the Forwarders tab in your Member Console and scroll to the alias: credit-report (as in the screenshot above). Notice there are multiple addresses and domains sending you email? 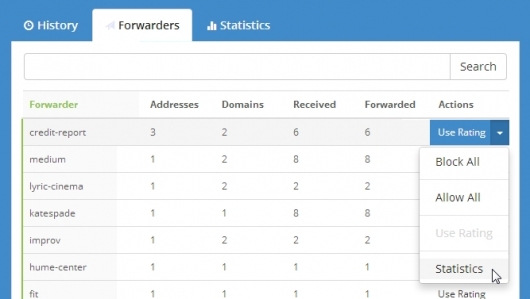 Select Statistics from the Actions menu to view all the senders. Once viewing this page, you can see a complete list of all the senders for this forwarder, including the original service in which you provided this forwarder: FreeCreditReports.com. The additional senders—other than those from freecreditreports.com—are the ones that FreeCreditReports.com sold your forwarder to: mortgagerefinance.org, debtconsolidation.net. If you provided your real email address when requesting a free credit report, now at least three different companies have it and are sending you bulkmail. With Bulc Club, you can simply disable the forwarder after you receive your free credit report and all three companies can no longer bother you. If you provided your real email address for this online service, it’s nearly impossible to request they stop sending you bulkmail. Disabling one of these unlimited, automatically-generated forwarders is part of the true power of Bulc Club. Alternately, if you choose to keep this forwarder, you can create a filter (or rule) in your mail client to automatically move messages sent to this forwarder (credit-report@smith.bulc.club) to a folder, such as “Credit Reports” “Junk Mail”, or even “Deleted Messages”. If your Gmail address is: john.smith@gmail.com, all mail sent through your forwarder credit-report@smith.bulc.club will be forwarded to john.smith+credit-report@gmail.com. All mail sent through your forwarder coupons@smith.bulc.club will be forwarded to john.smith+coupons@gmail.com. And so on. If you’re interested in helping us rid the world of bulkmail forever, we’d love to have you as a member.